CONDOR FOOD AND FORAGING IN NORTHWESTERN NORTH AMERICA presents the available data on the foraging ecology of the former Northwest population (about 50 pages). There is much management-related information in both papers, especially this one. THE CALIFORNIA CONDOR IN SOUTHERN BAJA CALIFORNIA, MEXICO, a one-page paper based on the evidence of cave paintings of an extinct native culture, illustrated (photo). These papers on the ecology and management of condors were researched, prepared, and independently financed by Ecological Perspectives as the latest in a continuing series of “Contributions in the Public Interest” on conservation issues in North America. The papers are the most complete and accurate data available for northwestern condors. Appendices provide details of the individual records on which conclusions are based, so the reader is able to make an informed assessment of the data. The papers can be reviewed online and downloaded for personal, institutional or professional use (go to the “Publications” page for year 2008). Donations from businesses or government agencies are appreciated. Contact me at ecoperspectives@yahoo.com. First the obvious: condors are one of millions of species, and the beauty and functioning of ecosystems derive from the interactions of all the species in totality. The California Condor is not just impressive and powerful, it is intriguing because its niche (that is its functional relationship to its environment) includes us. In Northwestern North America, California Condors associated with human beings in a symbiotic relationship for thousands of years. They scavenged fish remains at native indian villages, appropriated (“stole”) hunter-killed game. (See my paper of foraging on this website). Condors even fed on humans, on dead slaves discarded by their owners, and on tribal indians themselves when they died en masse from the epidemics brought to North America by Euroamericans. Condors were human undertakers. 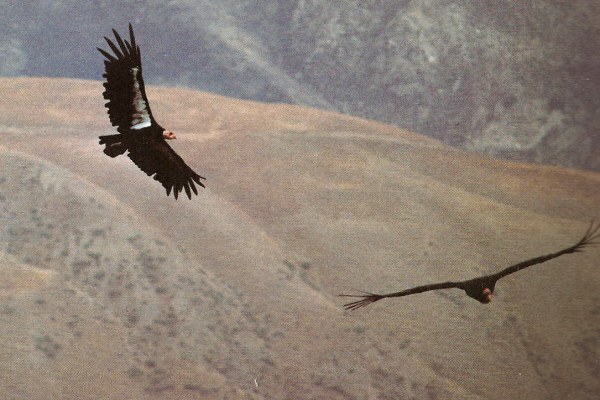 Such was the closeness of the association between condors and human beings. Setting aside for now the possibility that condors could in the future again perform the role of human undertaker to, perhaps what is most relevant about this human-condor association for us now is that we understand what caused the condor to be endangered and why it went extinct in the wild. Once dismissed, ignored, misunderstood, and denied by those who could see no ecological reason for their existence, it has been found that condors were dying at an unsustainable rate from the chemicals that are present in their environment. They still are, after they are reintroduced to “the wild.” The susceptibility of condors to poisons, and their dying, if we heed it, is a warning to us of our our own vulnerability to poisons contaminating the same environment we share with condors. Witness the lead poisoning of hunters and their families after eating big game shot with lead ammunition; arsenic and gasoline additives in the water we drink, pesticides in our food, benzene in the air we breathe, and the epidemic of cancer largely caused by chemicals. Native Americans viewed the condor as knowledge and power, as protection. It seems obvious we need the condor now more than ever, to prove to us that the environment we share as species is an environment which both species can survive in.